Take a cabin or berth aboard our chartered 4/5 cabin skippered yachts that give great space and fast cruising in warm sunny climes. Excellent tuition all week in a relaxed style, practise your passage planning and a bit of navigation, act as skipper onboard the boat under guidance or just kick back and join in the sailing elements when you want to. The whole idea is to let people have a holiday and those who want to relax and chill can do just that, but those who want more tuition are able to develop their skills and responsibilities aboard, under a watchful eye. Never Sailed? We take any experience level on this trip and even if you have never sailed you can join in to become a useful member of the crew with everyone taking turns on the helm and getting fully involved with the sail trim. Many inexperienced sailors may be concerned about sickness. It is just important to make sure that if you are prone to sea sickness that you take the medication and take our advice on how to combat it. There are many medicines, patches and bands that work well but let us advise you and do not be put off by the thought. It can be controlled. Life on Board. We try to keep the saloon areas clear using just the cabins if we can. With 5 cabins and at least 3 heads on the 51 footers with a total of 10 berths there is a lot of space. We are looking at 6 clients plus the Skipper and Mate on board. On the ‘buy a berth’ yachts everyone mucks in and helps out with the sailing and any galley chores but if you want a more exclusive trip you can take a yacht to yourself or your group and have your own private skipper. With more than one boat we can have a little inter-boat competition. Nothing like a race or two to hone the sail trim skills! Most evenings all on board and those sailing in company will ‘gather’ to have a ‘sun-downer’ in the cockpit with some nibbles and discuss the days activities- then on certain nights we would eat collectively ashore as a social group sort of thing but there is no pressure – do feel free to go and do your own thing! Start & Finish Location: Fly into Lanzarote (Arrecife) – there are flights from £130 return with a bag. Hop in a taxi for the 12 minute ride to join your yachts in the modern Marina Lanzarote close to the centre of Arrecife and meet with the other guys making up the crew from 5pm. We will show you to your yacht when it becomes available from 5pm on the arrival Saturday. We will not start sailing until 8am on Sunday so late arrivals are possible and it allows for any flight delays. We return to Marina Lanzarote by 4pm on the following Friday and start the hand back process (so if you need to catch a flight home that Friday night it is possible) clearing the boat by 8am on the Saturday morning. The size of a 51 foot boat means that they sail comfortably over 7 knots and will reach 8.5 – 9 knots under engine. This makes a big difference when covering distances and also the weight of the boat makes them more comfortable to sail in the predominately stronger winds in the Canaries so that they do not bounce and bob around like lightweight corks. Inside they are spacious and comfortable and have 4 large double cabins plus an ‘up and over’ bunk bed berth and 3 heads or more with showers plus bathing platform shower. There is also space to sleep in the saloon if we do need to spread around at night. 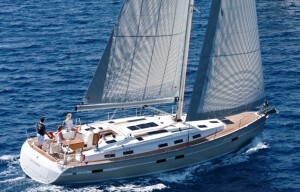 There are 3 cabin yachts available from 37ft for those that may wish to ‘sail in company’. Cruising Area? It really is a fantastic area and we will go anticlockwise on a circumnavigation taking the Islands of the Chinijo archipelago and also Los Lobos off Fuerteventura. The prevailing winds are North Easterly if the trade wind is doing its thing so we get to reach and fetch and hopefully not have to beat continuously! It is the open Atlantic and not typically benign Mediterranean conditions so generally you get good sailing all day without the typical Mediterranean lull in the morning. There are also certain predictable acceleration zones between the islands where the trade winds are squeezed into stronger areas of wind and we make sure that everyone is very competent at reefing to cope with these. Lanzarote This Island is a great favourite of the Yachtforce team. It has a real charm and a different side to it that is very interesting. Few Brits get to visit the Archipelago to the NE of the Island with its totally different pace of life. 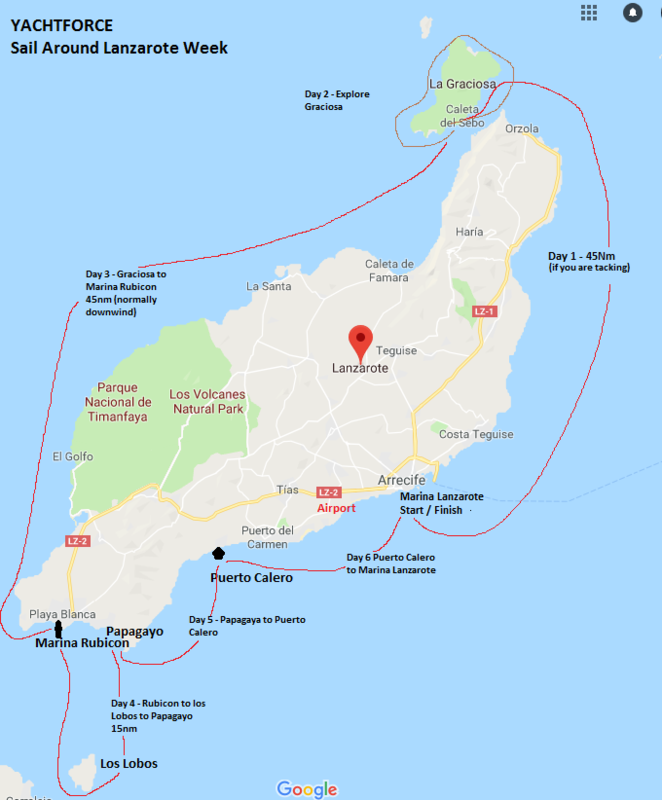 We have been in Lanzarote and adjacent islands previously and once we have left the airport not heard a word of English outside of the boat until we reached day 4. We have been stunned by what we have experienced in terms of culture, fantastic winter weather and wildlife! There are few places that we can safely say that we see dolphins galore – but Canaries has never let us down! The temperatures are a very pleasant 20- 21’C and down wind or whilst not sailing we wear shorts and tee shirts. Light weight waterproofs are useful to keep the chill and spray off in the upwind legs. Some stay in shorts most of the time but some people will pop on long trousers with a sweat shirt for the evenings. Bliss! 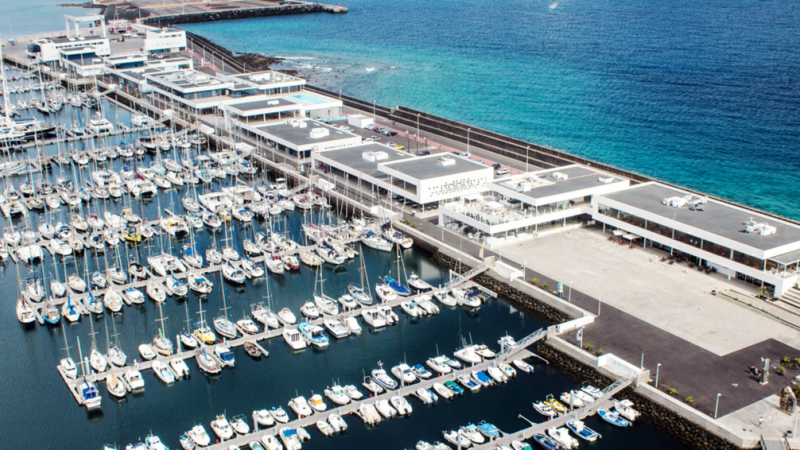 Arrival Day – Marina Lanzarote This is an excellent, large, modern marina with plenty of yacht maneuvering space inside which is close to the airport (under 15 mins taxi ride) with plenty of shops and restaurants on site. It has good toilet facilities adjacent to the mooring pontoon. Nearest large supermarket is 15 – 20 mins walk but you can get them to deliver. A pleasant 10 minute walk to local restaurants and you will not hear much English spoken as it is not a tourist destination. Yacht will be available to board from 5pm. We will settle in and then grab a meal locally so late arrivals are not a problem. Car hire is available on site at the marina but it is a tad more expensive than at the airport as it is aimed at cruise ship passengers. Plenty of parking. Taxis can be requested from the marina office and they will call them for you. The earliest we start sailing is 8am on Sunday. 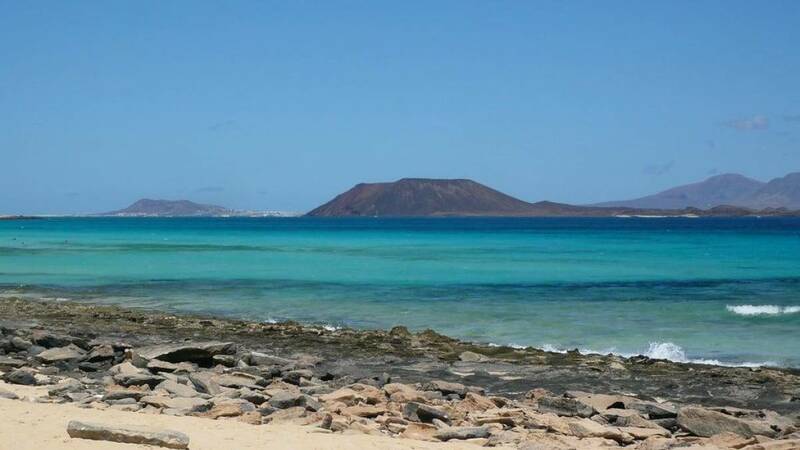 On the stunning secluded island of La Graciosa you can choose from staying ‘walk-ashore’ in the Marina or alternatively anchoring at Playa Francesa. Both require permission from the Canary Island Port Authorities. We recommend at least a week’s notice to allow for your berth or anchorage request to be processed but this can be helped along by your charter agent. Please note that there is no electricity provided with a La Graciosa marina berth (it is really just a pontoon in the attractive local fishing port) and no real showers ashore, however there is fresh water which is included in the price. Leaving from Marina Lanzarote you will set sail heading towards the north of the island passing the beautiful bay of Arrieta. The prevailing NE trade winds will require you to beat the 35nm to La Graciosa. You may have to reef down depending upon the prevailing winds. The passage will allow for all the crew to familiarise themselves with the yacht as tacks will be plentiful. 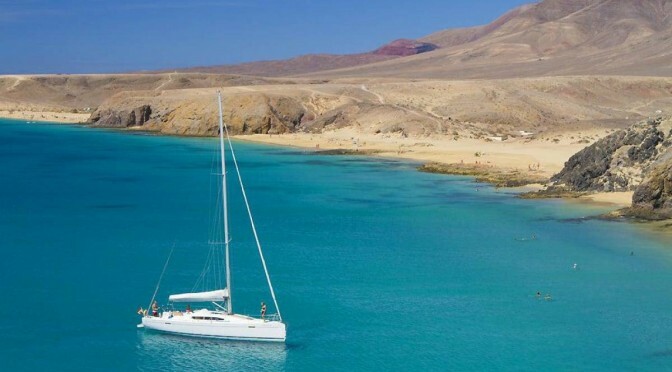 Sailing towards La Graciosa will expose the yacht to the moderate seas of the Atlantic. When sailing through the channel between Lanzarote and La Graciosa, you will find refuge in the calm waters and enjoy the spectacular panoramic views of the towering Famara Cliff face. We recommend that you plan your passage to arrive during daylight hours. There is plenty of room in the marina but drop sails before you go inside and watch out for the ferries coming and going and the large day sail catamaran that takes people around the Island and the to the anchorage in the day. There are security staff on duty outside of the Marina Office daytime hours that will check you are ‘on the list’ before showing you a berth. (the marina office opening timings are laid back and can be a little ‘haphazard’) Finger pontoons are short and if reversing a large boat in backwards with a strong downwind on the nose make sure you stabilise the boat quickly not to lose the bow – an effective stern line is good in some circumstances so you can drive against it. Smaller boats can be lucky enough to reverse stern into the prevailing wind on the down-wind side of the pontoon. After spending a night in the enchanting sleepy marina ‘Port’ village of La Graciosa or Playa Francesa, you may be keen to explore the coast of the island, hire bikes and explore the whole Island or simply walk to the stunning beaches. It is the most laid back place in the Canaries with only sand tracks and the occasional 4×4 taxi and very limited tourist accommodation. It is a great place to have a ‘down day’ just to chill and remember that you are on holiday. Canaries Cuisine – Fresh fish, Canarian potatoes (cooked in sea water) and some veg. 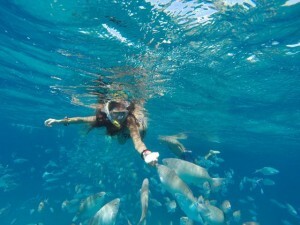 Great snorkeling and swimming and a great place to grab a 3 course lunch, including fish main with drinkable ¼ litre wine all for an incredible price of 8.50! 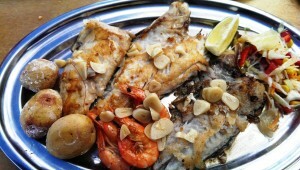 (or 10 euros if you push the boat out) Amazing value for some great food. We bumped into a French guy that was raving about the value lunch he had just had with excellent wine for only 8.50 – he seemed very impressed! There is the smallest museum in the world to visit and a couple of supermarkets for provisions (expensive) and some very reasonable restaurants. When the last ferry departs taking any local day trippers home it becomes very quiet. When I was last there I heard no English spoken apart from our boat. We took hire bikes and rode around the Island to explore on an afternoon ashore. Sailing around the Chinijo Archipelago is one of the treasures of the Canary Islands. It is a protected UNESCO marine reserve which stretches a total of 70,000 square kilometres, making it the largest marine reserve in Spain. It is not permitted to fish ‘commercially’ in this protected reserve as the rich marine ecosystem is unique and essential to local inhabitants of the islands so you do not have huge fishing boats ripping everything out of the sea. Wildlife is plentiful with sightings of Cetaceans a regular occurrence around Lanzarote. There are no other permitted anchorages or those that are protected from the prevailing winds apart from Playa Francesa. Leaving La Graciosa always leaves you with a feeling of doubt. You may wish to extend your stay for another night as many of our clients fall in love with the tranquillity of the island and its peaceful bays. 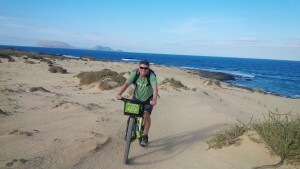 Your passage to the south of Lanzarote will take you along the rugged coastline of Lanzarote. Along the way you are highly likely to encounter dolphins, who tend to play on the bow allowing you to take videos and pictures galore. The passage along the west coast allows for some downwind sailing with the prevailing wind coming from the NE. We have made this passage with a NW previously and large swell that changes shape dramatically when you close with the land. From 10 nm offshore you are in 3,000m of water with much smoother but large sea state. Just be aware that within 5 nm off the coast the water shallows dramatically from 2,000m to 300m quickly with the resultant steepening of the waves and more difficulty for the guys on the wheel. You come into the lee of the land comes once passing the lighthouse at Playa Blanca. You will have the option of either staying in Marina Rubicon, an exceptionally well equipped marina with WiFi, showers, toilets, water and electricity. If you are looking for a quiet night at anchor, we recommend an overnight stay at the beautiful bay of Papagayo. The waters are pristine and you will have shelter from the NE winds but there can be some ‘wrap around’ swell if there has been any West in the recent winds. A sandy seabed makes for reasonable holding and the shelter can give a peaceful night’s sleep. With just a short passage of 15 Nm round trip, this day can be used to enjoy being at anchor and having a lazy day. 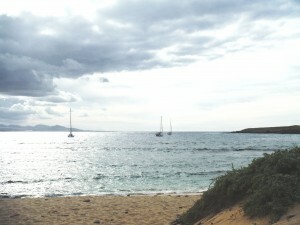 Los Lobos has an anchorage on the southern side of the island. There is an inside bay that looks tempting, however there is a shallow reef that does not permit entry via yacht. Also note if there is large swell running from the NW do watch the shallow area to the SW of Los Lobos as it is charted at only 7 m deep here and the swell can break making for a hairy experience. The island does not have any inhabitants, only an information centre exists with no shops or supermarkets. The anchorage can get quite crowded with day charters coming from Fuerteventura, however as the sun begins to set, most of the boats head back to port leaving you with your own private island. After a night at anchor, your next port of call is the exclusive Marina Puerto Calero. It is very tastefully done with excellent restaurants, facilities and shops. Puerto Calero has fantastic restaurants and all the amenities you could expect from a world class Marina. Before departing the next day for Arrecife, make sure you fill up with diesel as there is currently no fuel berth at Marina Arrecife. You will travel along the south east of Lanzarote where you can enjoy the calm waters due to the lee of the land, with plenty of wind. This passage is breathtaking and comfortable. At the halfway mark, you find a black sandy beach called Playa Quemada. 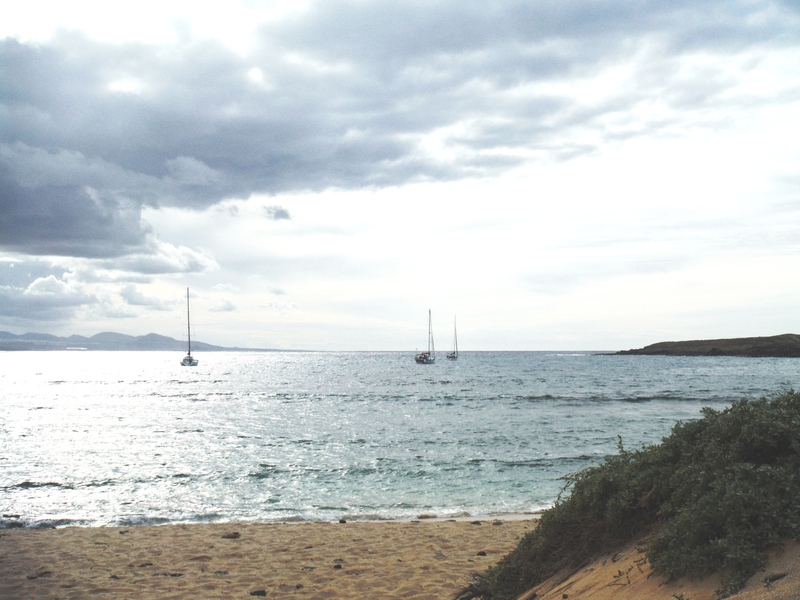 This is an ideal Anchorage for a quick swim before heading into Puerto Calero Marina. The area is known for whale watching. Among the many species, Pilot Whales and Common Dolphin are most likely to be seen. This passage again offers the lee of the land, protecting you from the Atlantic swell while enjoying the trade winds. The route passes the coast of the tourism town of Puerto Del Carmen, where you will find long stretches of golden sand and clear blue waters. As you make your way back to your starting point you will also pass the island’s capital Arrecife. The natural reefs and small fishing port will get you in the mood to explore them on dry land after arriving for your final evening in Marina Lanzarote. All yachts are due back at 1600 hrs, you will be greeted by the charter base team who will assist with your berthing and then take you through the hand back procedure. Have a great final night on board or exploring the local town before departing the following day. We normally have a group meal on the Friday evening and most people depart on the Saturday morning as we clear the boat by 8am Saturday morning.